Fishing on the Bois Brule River in Douglas County, Wisconsin begins on the last Saturday in March, from U.S. Hwy 2 downstream to Lake Superior and continues through November 15. Fishing is prohibited from one-half hour after sunset to one-half hour before sunrise before the first Saturday in May and after September 30. The section of the Brule River upstream of U.S. Hwy 2 and all of its tributaries open to fishing on the first Saturday in May, (at 5:00 AM) and remains open through September 30. Examples of Brule River tributaries are Casey Creek, Rocky Run, Trask Creek, Little Brule, Wilson Creek, both East and West Forks of the Brule, Nebagamon Creek, and Blueberry Creek. The spring steelhead run usually begins in late March and extends through May. During the first several weeks of the early season, the vast majority of steelhead caught are fish that remained in the river from the previous fall run. Bright, spring-run fish start appearing in April and continue through early May. Water temperatures dictate peak movement. Most fish are taken on yarn flies, spawn, large caddis fly imitations, and various types of hardware (i.e., spoons and spinners). The deep runs and pools are favorite holding areas for the fish. A small run of chinook salmon ascend the river from early July through mid-October with a peak somewhere during mid-August to late September. 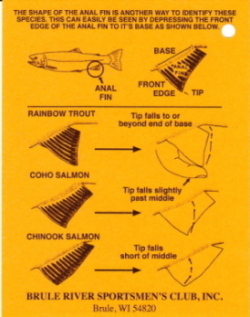 Most chinook are taken soon after they enter the stream. At this time they are still silver and are quite a battle for even the most experienced fisherman. They seem to prefer flashing lures like spinners or spoons and tend to hold in the slower, deep water. The lake-run of brown trout begins in early July and extends through late October. The peak is from mid-July to mid-September. Favorite baits include spoons, spinners, flatfish, and live bait such as night crawlers. The brown is not an easy fish to catch, but with persistence and by fishing the slower, deep holes during low-light periods, the odds of landing one should be in your favor. Coho salmon are found moving up the Brule from late August to late November. Depending on water conditions, the peak is usually sometime in September. 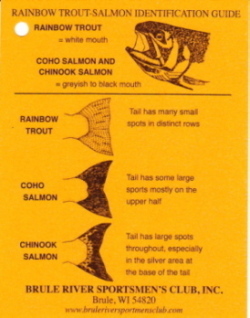 Coho can be caught on a variety of bait selections. They seem to prefer the slower water areas. The fall run of steelhead begins moving up the Brule in mid-August and continues through late November. The largest runs usually occur sometime between mid-September and late October. Water conditions (i.e., temperature, water level, clarity) will affect the exact timing of the run, so the peak will vary from year-to-year. One can expect to find the fish associated with the moderate velocity areas but usually behind or near some type of current break (i.e., rocks, logs, stream bank). They will tend to hold in the deeper holes as the water temperature drops later in the season. A wide variety of baits which includes yarnflies, spawn, flatfish, and all types of spoons and spinners are appealing to fall-run steelhead. The river north of U.S. Hwy 2 has many well-marked access points all the way to Lake Superior. They are located throughout the lower river and provide an excellent opportunity to fish different sections of the river as it changes character. The Club has a map of the lower river for sale. Click on Club Store to purchase one. The section of river south of Co. Hwy B is noted for its resident brown and brook trout fishery. Some of the best fishing occurs in the stretch between Co. Hwy B and Co. Hwy S (special regulations stretch). This part of the river is slow and wide and is excellent for fly fishing. The larger insect hatches occur in this area from May to the end of June. This area gets a heavy amount of canoe traffic during the summer months, especially during weekends. The Club also has a map of the upper river for sale. Click on Club Store to purchase one. The land adjacent to the river between Stones Bridge on Co. Hwy S to just below Co. Hwy B is mostly privately owned, so access is limited. There are two state forest campgrounds located on the Brule River. Copper Range is located approximately four miles north of the town of Brule. The other (Bois Brule) is located near the Ranger Station, about one mile southwest of Brule. There is no electricity provided at either of these sites. If it is desired, a private campground (Brule River Campground) is located in Brule on U.S. Hwy 2. 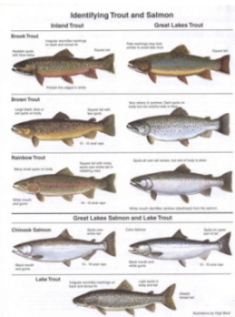 The links below for spawn rules, the most recent fishway counts, and trout and salmon identification pages download as pdf files that requires Adobe® Reader®. If you don't have this software you can download it free by clicking on the Adobe Reader link below. The Wisconsin DNR has created the following video providing some useful tip about how to canoe the Brule in a responsible manner. Click on Canoeing the Brule.